At this step, we withdrawn leg with precise characteristics of weight and quality. 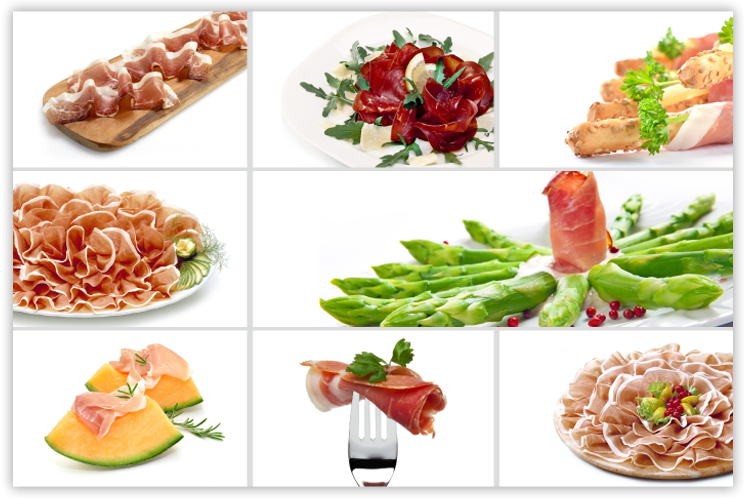 Legs coming from 11 regions of middle-north of Italy, discarding that present any kind of imperfections. 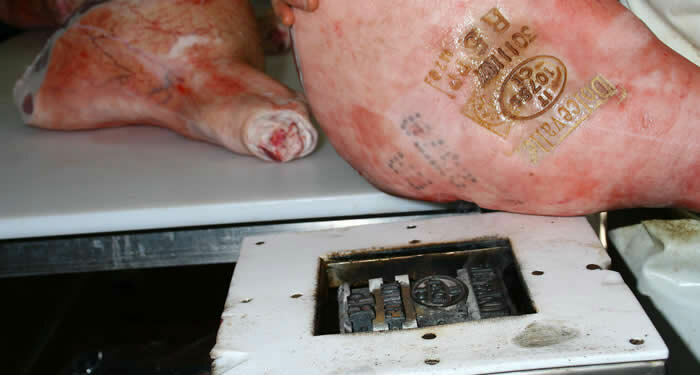 A indelible tattoo, placed on legs, is a identification of livestock origin; while the fire stamp affixed identifies the slaughterhouse or cutting plant. 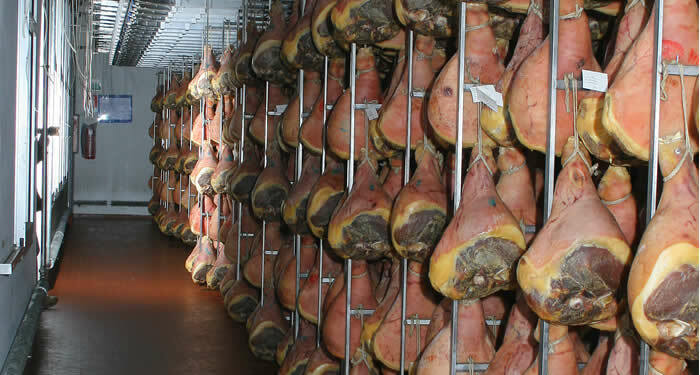 The initials “PP” indicates “Prosciutto di Parma”. temperature inside the legs must be between 0°C and 4 °C. 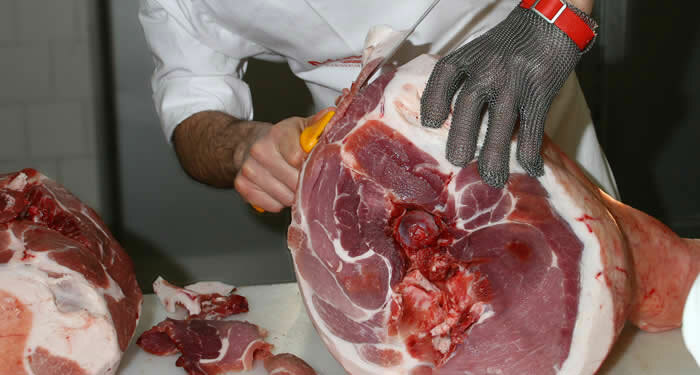 Legs are carefully trimmed removing part of the fat and rind to obtain the characteristic shape of Prosciutto di Parma. 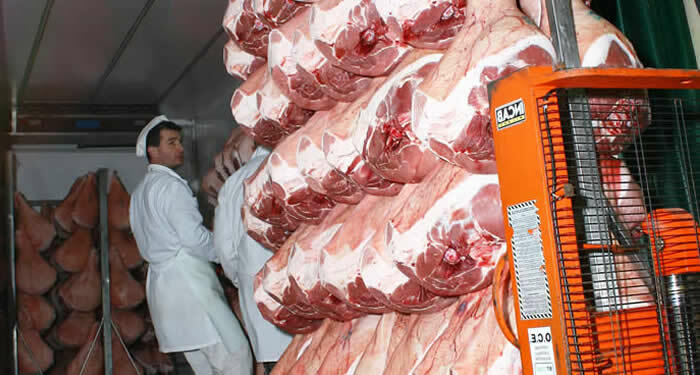 Every single leg is branded the marks identifying the number of seasoning factory (IT 1075 CE), salting date, lot number and identification letter of the origin slaughterhouse. 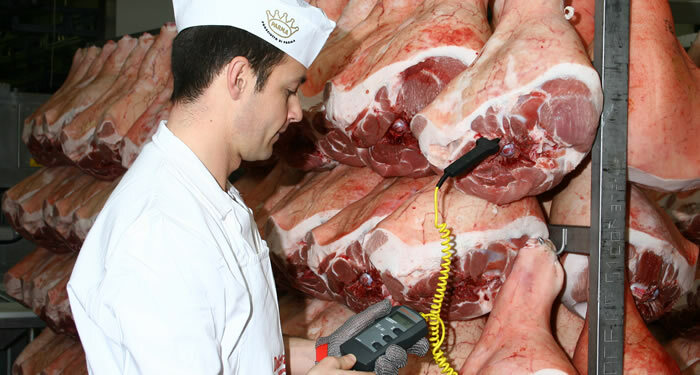 This ensure the traceability of the product in every step of processing. 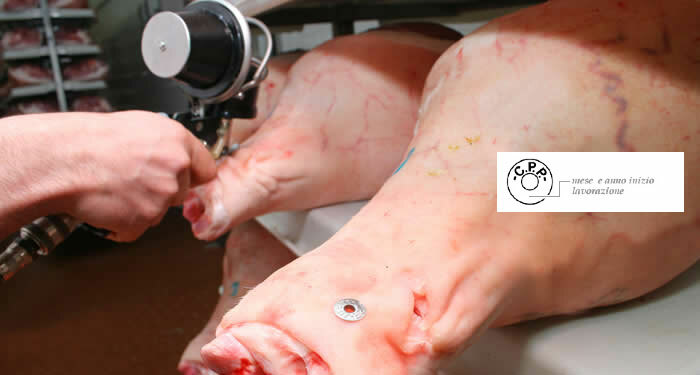 A metal circular seal is placed on the far end of the leg. This identify the staarting month and year of the working process. 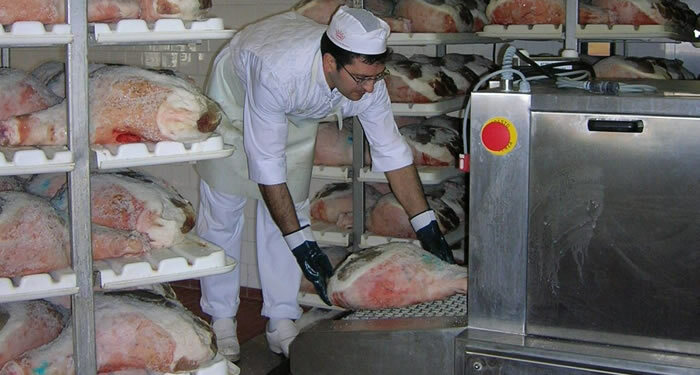 Before salting, legs are stored in a Reception cell with a temperature between 0 and 4,5 °C. 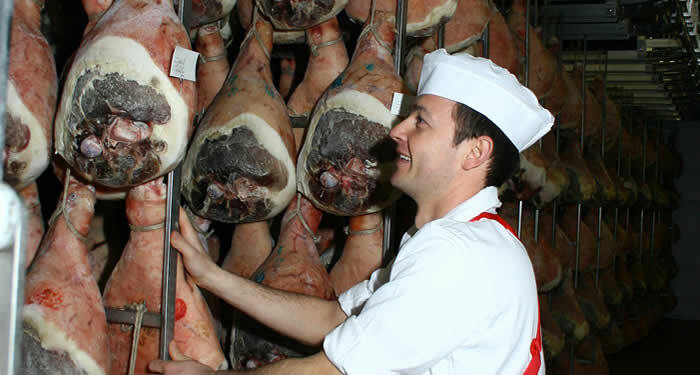 After 24-96 hours from slaughter (but not over 120 hours) legs are salted. 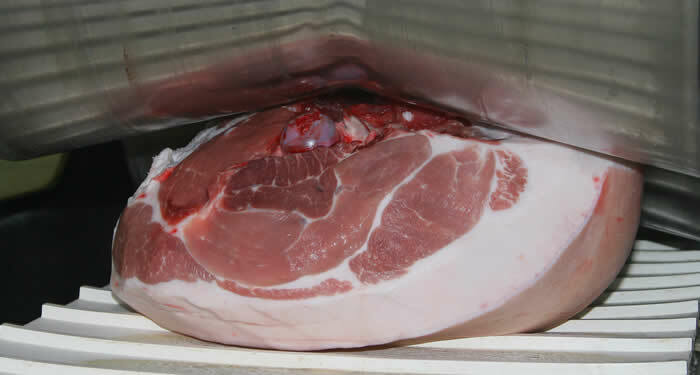 Salting has separated in two steps. The first salting exalt absorption capacity and conditions the dosage of the next stage. 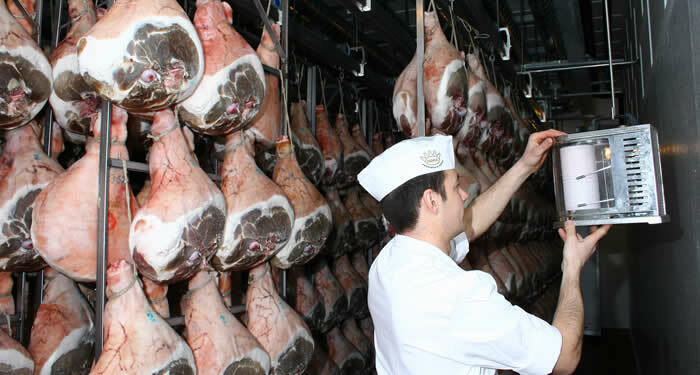 The first bleeding is done during salting process. 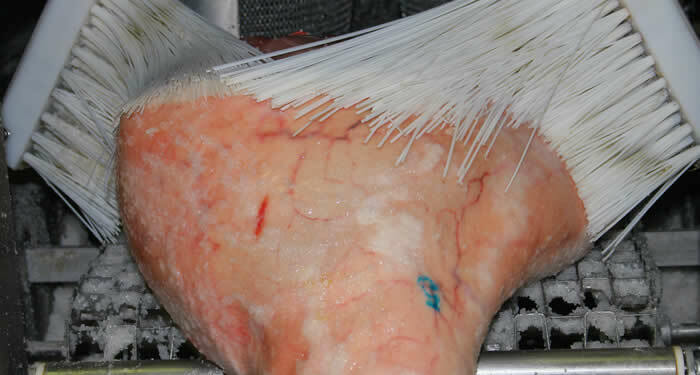 It’s done with special machine that remove the blood from the exposed muscolar surface. 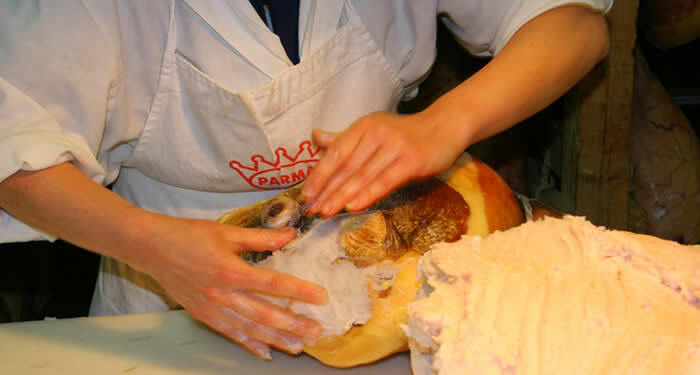 After pre-saltin, the stuff legs are salted by stuff using dry-salt (this step is performed by hand). 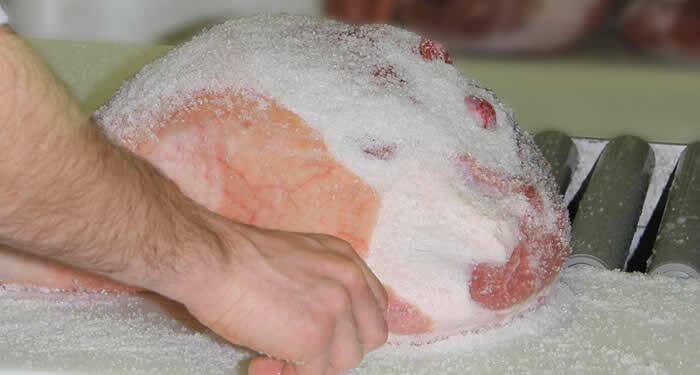 Salted legs are placed in a cold cell, called “first salt”, at 0 - 4,5 °C for 5/7 days. 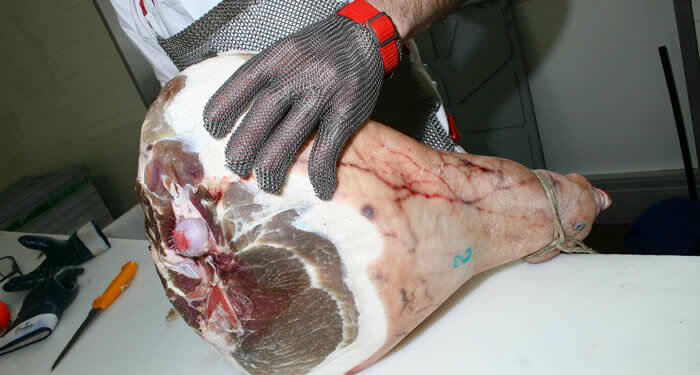 Cleaned from residue salt, legs are “desalted“ and then massaged by “Masseuse”. Legs are salted again in similar way to previous. 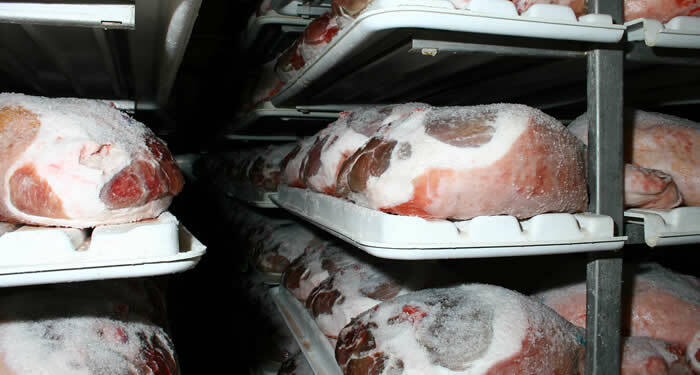 Legs are stored in a cell called “second salt” for about 15 days. 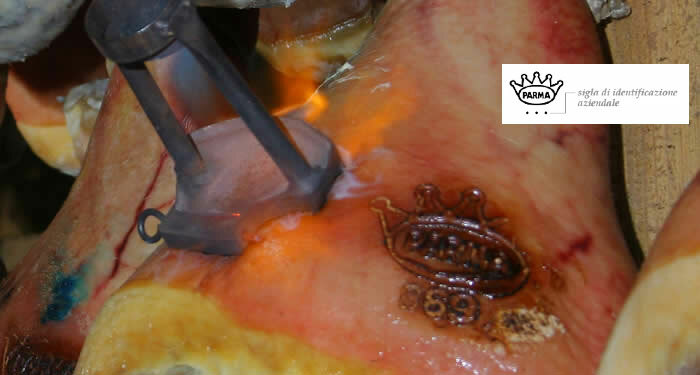 The ends of the bones of the hip are removed using a pneumatic saw. 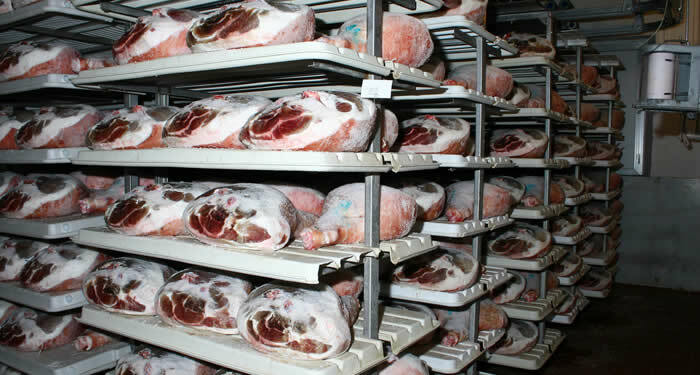 Legs are stationed on special vertical frames in a pre-rest cell for about 15 days at 0-4,5 °C of temperature. During this step, legs are groomed cleaning and removing any deposit of the muscle around the walnut. 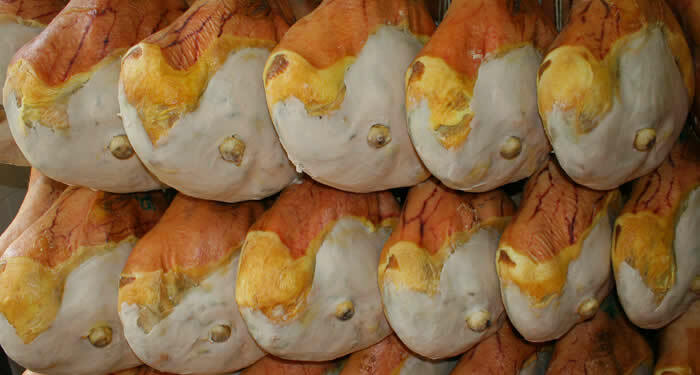 Legs are stored in resting cell and then in the final rest cell. 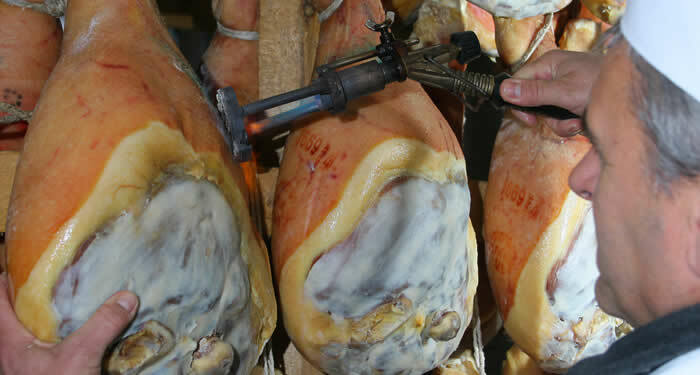 During this step salt penetrates deep and distributing within of the whole leg. 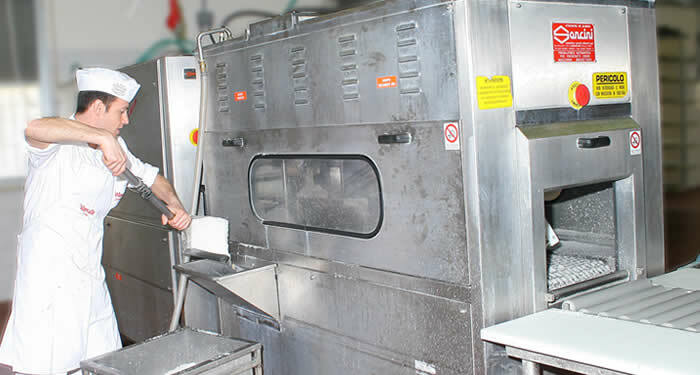 After the period of pre-rest and resting prosciutti are washed in a special "vertical washing machine" with hot water, to remove any salt crystals or impurities. 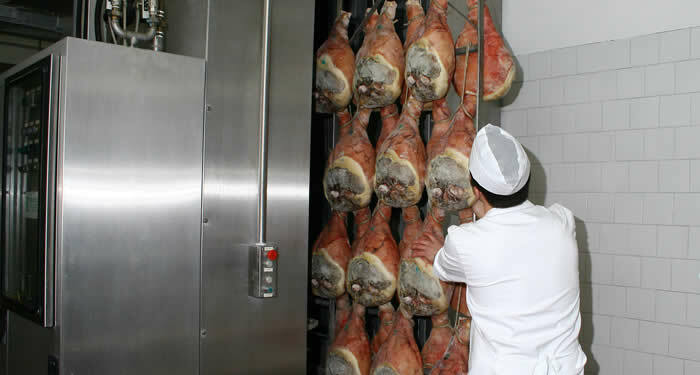 The following step is to dry legs in special drying-room for 5-7 days at 15-20 °C, thanks to the air convective movement. 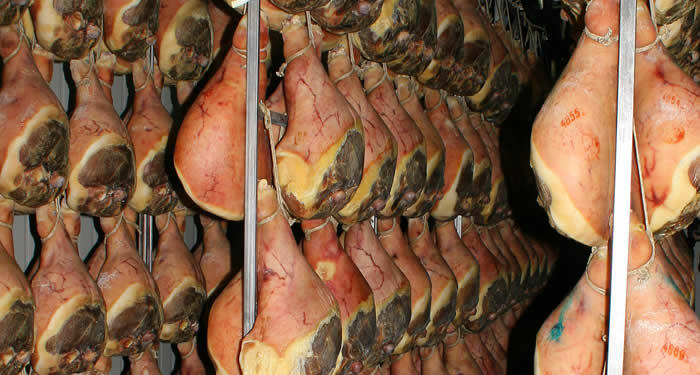 Prosciutto are now hung to special racks. 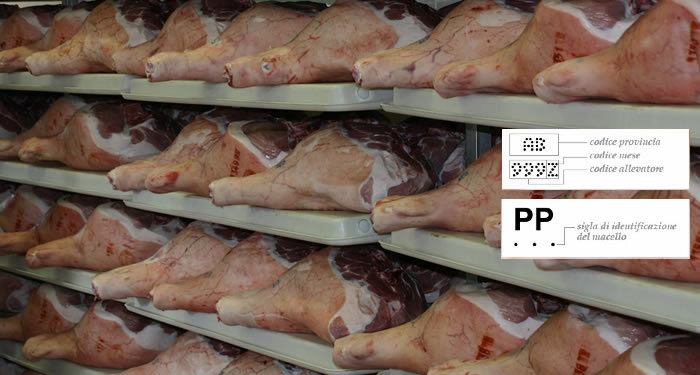 Here they are seasoned for 80-90 °C at controlled temperature. 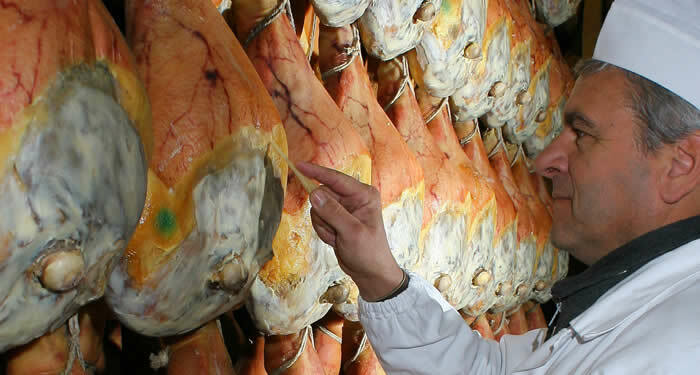 After pre-seasoning and check with horse bone pin, prosciutto are now prepared for larding process. 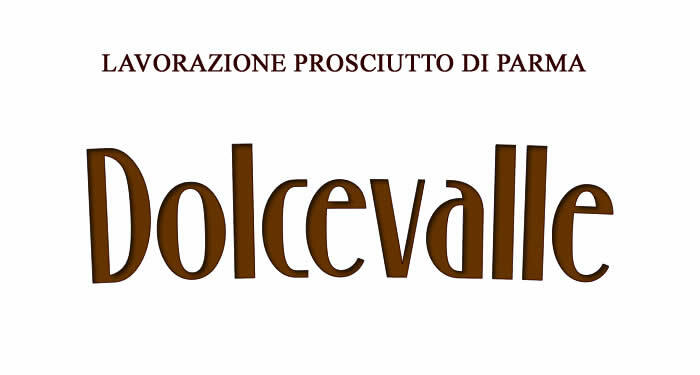 Between 7 to 8 months, prosciutti are stored in room know as “cantine”. 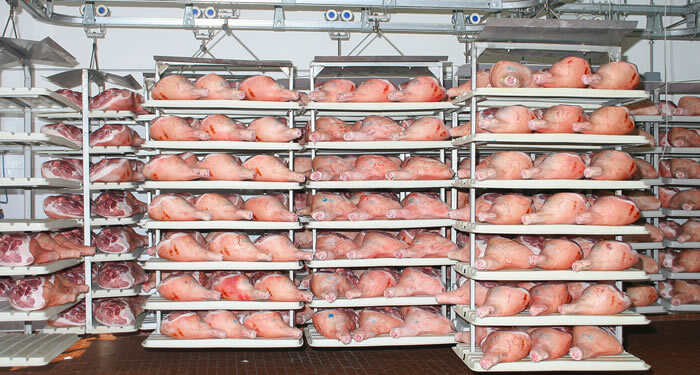 These places are fresh and less ventilated than drying room. 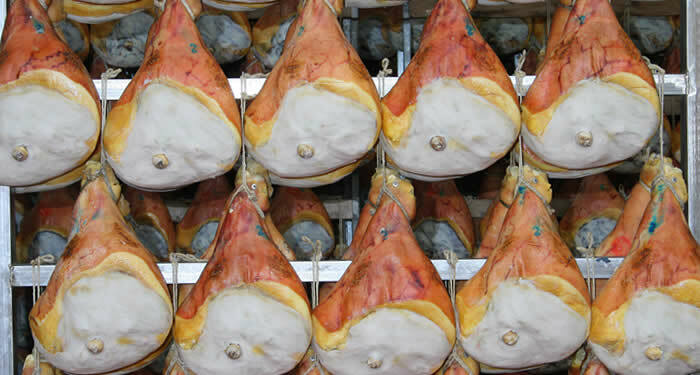 Prosciutti are hunged on traditional wooden racks and stored until they are distributed on market. During this step the muscolar exposed part can be filled. 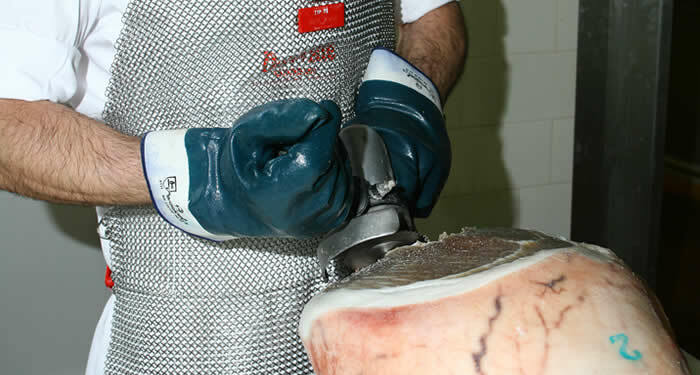 During this step, a pin made by horse bone is inserted in different point of the prosciutto. Horse bone has the characteristic to absorbe odors very fast. 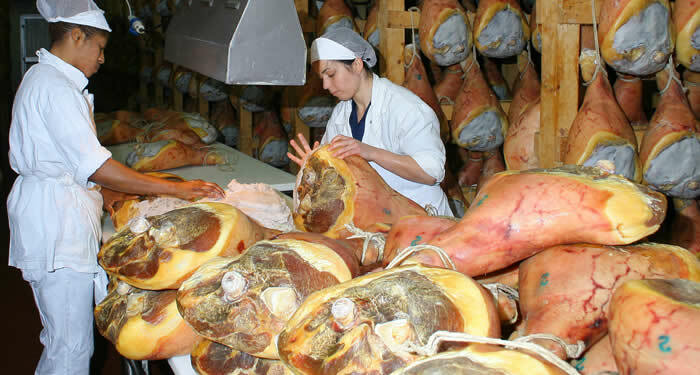 After 12 months minimum, legs are approved by Istituto di Parma inspector.. After this they mark every legs. 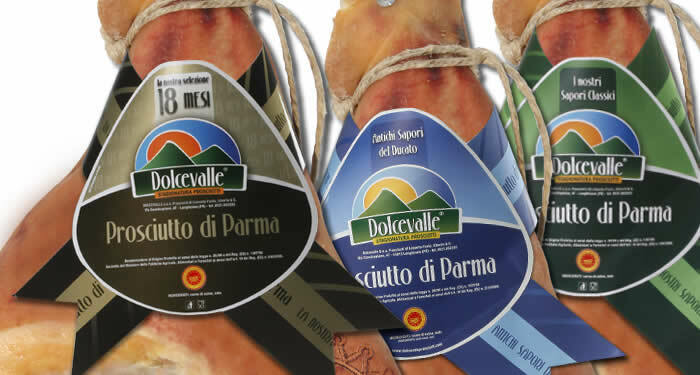 Now, the Prosciutto di Parma “Dolcevalle” is ready to be sold.